A first line was in fact attempted between present day Johore Bahru - Gunung Pulai distance 20 miles in the state of Johore, the track was made by timber. 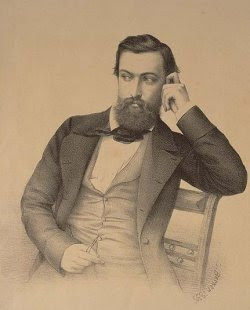 The earliest proposals to build a railway through Singapore was put up by engineer W. J. du Port at an estimated cost of $200,000. However, a trade slump resulted in the project being shelved. Another proposal by the Tanjong Pagar Dock Company was put forward to the Governor of the Straits Settlements but public opinion was against the use of public funds for private interests. Sir Andrew Clarke announced his support for the construction of a railway for private use. 20 February 1880 - The first line Taiping - Sapetang was planned by Sir Hugh Low. Construction of a railway line begin at the mouth of the Sapetang river to Taiping. Class A locomotives first appeared in 1884 for Perak and 1885 for Selangor.They were only given the Class A classification sometime after the formation of FMSR in July 1901 and there were 18 in all, plus 7 similar B class. 1 February 1885 - The first section of the Malayan Railway was a seven and a half mile track, opened between Taiping and Sapetang, serving the main mining area in Larut. First Kuala Lumpur Station known as Kuala Lumpur and was located near Market Street opened in 19 September 1886. The next section opened was the 21-mile run between Kuala Lumpur and Klang River (Bukit Kuda), Residen Station was built within this line. Kuala Sapetang was renamed Port Weld. July 1888 - first train crash in the country occurred in Sungai Kerawai near Teluk Anson, Perak. The Johore Wooden Railway was in disuse. 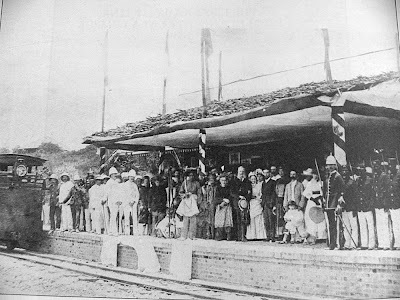 4 November 1890 - Opening Keretapi Sungei Ujong Railway line. 6 May 1890 - Opening section Taiping - Kamunting. 15 September 1890 - Opening section Klang River - Klang. Three 0-6-2T locomotives (later FMSR Class J) built for the Sungei Ujong Railway in 1891. 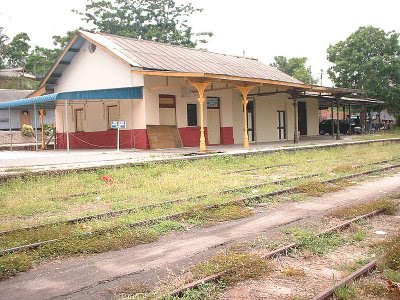 Official records show the date of the second Kuala Lumpur Station as 1892-1909. It was the first station on the site of the present KLO station. When it opened the station at Market St. became a goods station. If it did open in 1892 it would make Sultan Street Station the fourth in KL as Residents station opened in 1892. 1 July 1892 -Opening section Kamunting - Ulu Sepetang. 7 November 1892 - Opening section Kuala Lumpur - Batu Junction - Rawang. 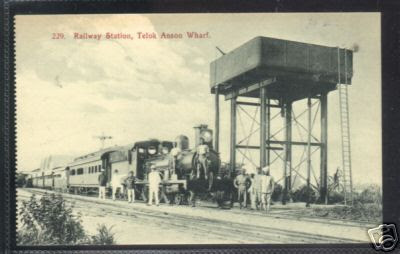 19 May 1893 - Opening section Teluk Anson. 1 June 1893 - Opening section Kuala Lumpur - Pudu. 10 July 1893 - Opening section Rawang - Serendah. 6 September 1893 - Opening section Tapah Road. 17 October 1893 - Opening section Batu Gajah - Ipoh. Elephant derailed a train (Teluk Intan). 27 April 1894 - Opening section Kota Bharu - Batu Gajah. Opening section Parit Jawa - Sungai Pulai. 29 September 1894 - Opening section Tapah Road - Talam. 6 October 1894 - Opening section Serendah - Kuala Kubu. 1 March 1895 - Pudu station was opened. 1 March 1895 - Opening section Pudu - Sungei Besi. 18 March 1895 - Opening section Talam - Kampar. 1 May 1895 - Opening section Kampar - Kota Bharu. Opening line from Ipoh to Teluk Anson to tap new tin deposits at Kinta. 1 June 1896 - Opening section Ipoh - Tanjong Rambutan. 27 November 1896 - Opening section Tanjong Rambutan - Chemor. 5 July 1897 - Opening section Chemor - Sungei Siput. 14 August 1897 - Opening section Sungei Besi - Kajang. 1 July 1898 - Opening section Sungei Siput - Enggor. Teluk Anson had overtake Port Weld to become Perak's chief port of exit. 1 January, the extension from Klang to Port Swettenham, nearly 5 miles, was opened for passenger traffic. Terminus of the railway, on Klang Straits, and extensive wharves have been constructed. 1 July 1899- Opening section Prai Bukit - Mertajam. 1 September 1899 - Opening section Ulu Sepetang - Pondok Tanjong. 1 November 1899 - Opening section Krian River - Bagan Serai. Frank Swettenham had planned to connect the FMSR from Prai to Singapore passing through Johor. Construction of railway line between Gemas and Johor begin. A single 4-4-2 tank locomotive (later FMSR Class K) built for the Sungei Ujong Railway.